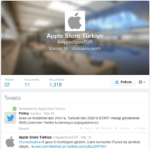 Apple has recently opened its first retail store in Turkey. The store had a little more than 14,000 visitors opening day, reports the Turkish Apple blog elmadergisi, citing insider sources from Apple Turkey. If this number is accurate, this is a new record number for the number of visitors to an Apple retail store on its opening day. 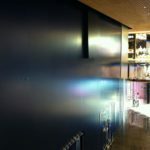 Elmadergisi states that the store had more than 4,000 visitors within the first three hours of its opening. According to ifoAppleStore, the previous record for the most opening day visitors was at Apple at Regent Street. There were 11,000 people who visited the opening of Apple Store at Regent Street in London. I know that they had 4,500 T-shirts, and that at 4 p.m. they were still handing them out. However, if they had given out all the T-shirts by 4 p.m., they would have had to greet another 9,500 visitors from 4 p.m. to closing (10 p.m.?). That would be nearly twice the number of visitors that arrived in the first 6 hours, so it seems to be a little high. But it’s certainly possible. 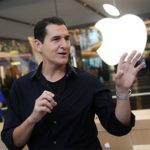 Even though Apple CEO Tim Cook and Turkish president Abdullah Gul did not attend the opening, as previously rumored, the store still had a impressive grand opening. 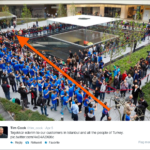 Tim Cook tweeted on the opening day thanking the Turkish people. We posted earlier pictures from the opening day. The Istanbul Store is Turkey’s first Apple retail store. Apple reportedly will open three more stores in the country within two years.